In this tutorial, we'll create a sample application that receives EasyPost Tracker updates via webhooks and sends SMS messages with Twilio. The EasyPost Tracking API makes it simple to get EasyPost tracking updates with webhooks. Your application can be notified and take action as a tracking update happens. In this tutorial, we'll create a Flask application with the EasyPost Python Client that can receive webhooks from EasyPost. 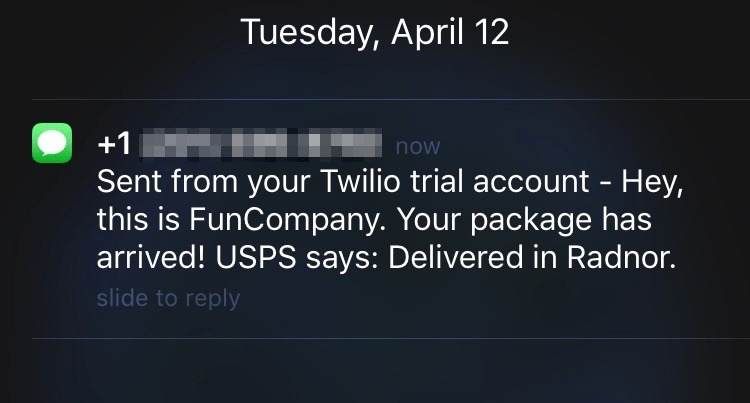 Then, we'll use the Twilio API to send a message to a test customer after a package gets delivered. Although we'll use Flask (and Python) in this example application, this functionality could be integrated into any app written with Ruby, PHP, Java, and other languages with EasyPost's official client libraries. Check out the Tracking Guide to get a feel for how Tracking works with EasyPost. Make sure you have Python and pip installed. The first thing we need is an API key from EasyPost. This is an example application, so we're going to use the test API key (of course, in a production application, you should use your production key.) You can find your test key on the API keys page. Copy the "Account SID" and "Auth Token". Then, click "Get your first Twilio Number" to generate the number the SMS messages will be sent from. Paste your "first Twilio number" in SMS_FROM_NUMBER. For SMS_TO_NUMBER, fill in the number of the cell phone you'd like to test with (of course, it must be able to receive SMS messages). In these first couple of lines, we import the dependencies we installed, the app is defined and the config variables are loaded. In the last two lines, we instantiate the EasyPost and Twilio Python clients with the keys and tokens from config.py. message = "Hey, this is FunCompany. " message += "Your package has arrived! " message += "There's an update on your package: "
return "SMS update was sent to the customer!" There are a few lines there, but the code is fairly straightforward! We know from the Webhooks Guide that incoming webhooks are POST requests, so we route /easypost-webhook with the POST method. We also know from the Tracking API that webhooks for tracked packages come in an Event object, so we create one with the EasyPost Python client. Next, we compose a message to be sent to the customer. In this example, we have some logic dependent on the status of the shipment, and create a message which includes the most recent tracking information. Because the order of tracking details can vary, we iterate through the list of tracking details until we find one that matches the status of the Tracker. It's time to get the app started and see if we can get an SMS notification! Open your shell, and run $ python app.py. The app is now running on port 12345, but there's one problem - since it's running locally, EasyPost has no way to access it! In a production application, our app would be running on a remote server, but there's no need to set one up for this example. Instead, we use a tool called ngrok that can temporarily tunnel our app to the outside world. $ ngrok http 12345, and ngrok will take care of all of the heavy lifting. You should see a URL that looks something like "https://something.ngrok.io" in ngrok's output - copy it. Awesome! If you're interested, try playing with message customization using attributes listed in the Tracking API. You can download the code (with tests) for this tutorial on GitHub.